The Hanna Phosphate Checker is an awesome little tool that will give you accurate easy to read results. If you have bad eyes or have a hard time with color change test kits, the digital readout on the Hanna checkers is super easy to read. The biggest key with Hanna checkers is keeping the vials nice and clean for consistent results. Three simple steps to results. 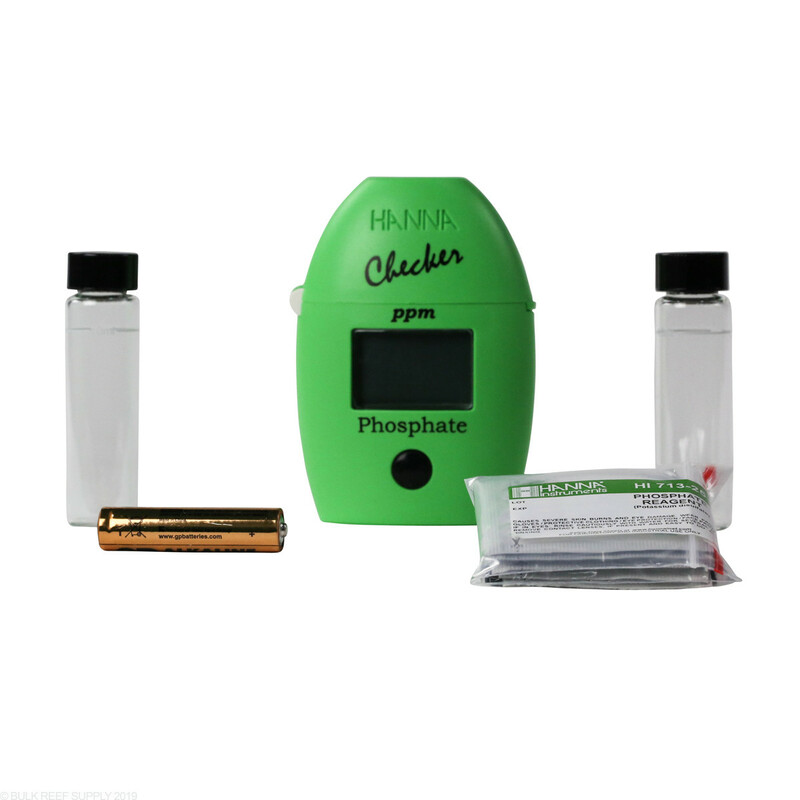 The Hanna Phosphate Checker bridges the gap between simple chemical test kits and professional instrumentation. Accurate, affordable and easy to use. First, zero the instrument with your water sample. Next, add the reagent. 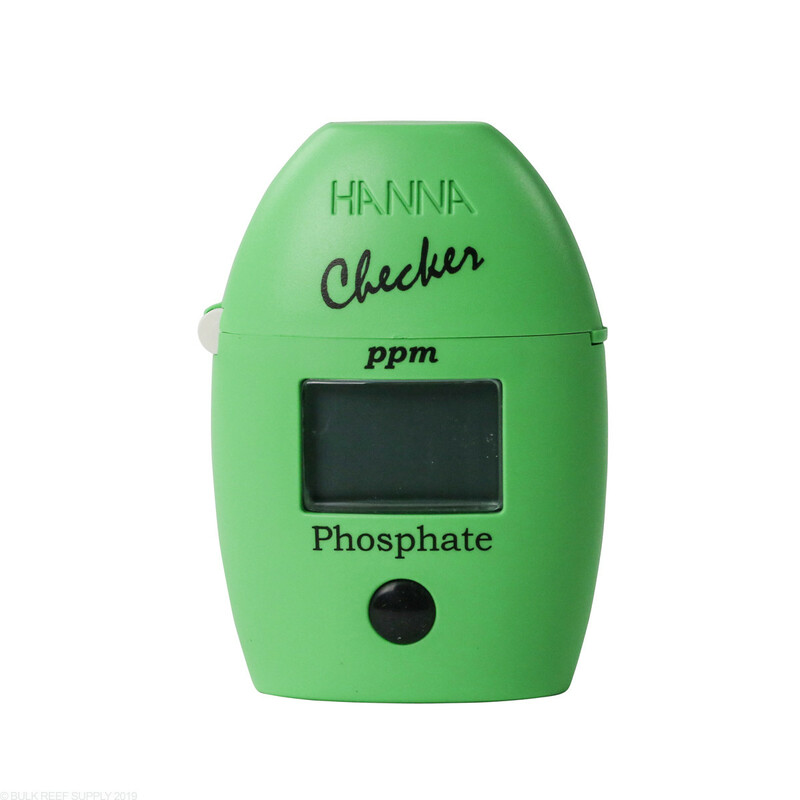 Last, place the vial into the Hanna Phosphate Checker, press the button and read the results. Done. Adaptation of Standard Method 4500-P E Accuracy 4% ±0.04 ppm (mg/L) of reading 0.04 ppm (mg/L) resolution (250 points) Large, easy to read digits Auto shut-off. Designed to work with HANNA's powder reagents Uses 10 mL glass cuvettes. Weighing a mere 65 g (2.3 oz. ), the Checker®HC easily fits into the palm of your hand or pocket.Use for quick and accurate on the spot analysis. Single button operation: Zero and Measure Operated by a single AAA battery. Method: Adaptation of Standard Method 4500-P E.
No matter How perfectly I perform the test it always reads 0.0 which definitely isn’t correct. Accuracy of +/- 0.04 is too poor for knowing where your phosphate is for a reef tank. I have never had a problem with my readings. Pretty consistent with Triton tests. The only reason it's getting 4 stars instead of 5 is because of dealing with the powder packets. It's a little difficult getting ALL of the powder into that little vial. This may lead to the inconsistency people are complaining about. Use the Hanna ULR for reef tanks in this hobby, not this. Use this for FOWLR or Freshwater only. I have the Hanna ppm checker and it's pulling weird readings. First .23 ppm then .20 ppm then .15 ppm then .20 ppm then .13 ppm then 0.15 ppm then .19 ppm.... I don't know which is the right reading and I've wasted all my phosphate packets... I made sure there were no bubbles and made sure the powder was dissolved fully. I contacted Hanna with my concerns. No response yet... :( $50 bucks down the toilet. 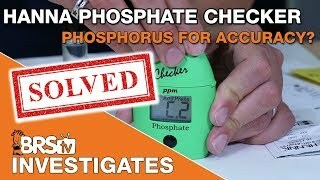 Hard to get an accurate phosphate test. This one does the job well. I'm testing in freshwater only. 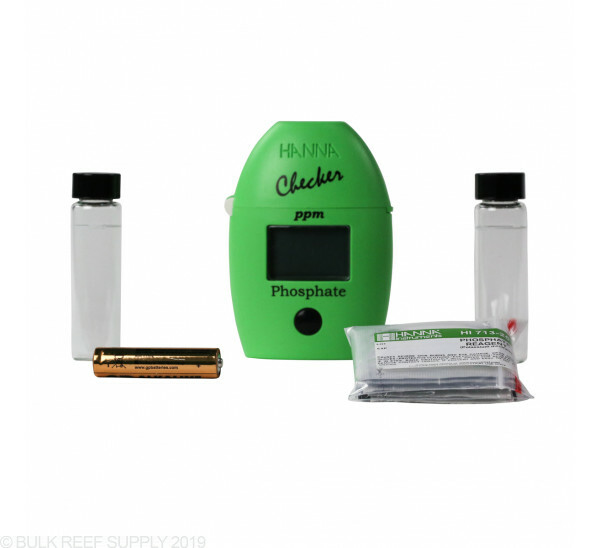 After trying to determine my tank's Phosphates with other kits, I decided to get a Hanna checker and it worked well, and clearly provided feedback to me depending on the actions I was taking. My readings went from 0.08 to 0.03, then 0.01 and finally to 0. I know it works because if I don't change the GFO in my reactor on time, I start getting 0.01-0.02 and when I replace the media it goes back down to 0. It must have a margin of error but I has worked for me. - Timeout is tight and if I'm not on top of my test, the unit will timeout and I have to restart the test. - It's not easy to get all of the content of the reagent packets into the cuvettes. This unit is great in theory but can't be counted on for accuracy under any stretch of the imagination. It test's 0-00 on my reef tank when that's qualitatively impossible for the condition. I've tested my tap water and only find 0.43 while the city says it runs on average 0.80. Tested other tanks with results of 0.00 when other test kits show trace amounts. Took my water to a local chemical test lab and found phosphate to be 0.02. I understand the accuracy, repeatability and reproducibility issues but shouldn't always be on the - side instead of +/-. I'm not particularly impressed with Salifert but it was the closest to Salifert. At least close enough to manage a marine aquarium. I have had this product for about a month or 2 now and it keeps on reading 0.0, Not sure if i have a one that is broken. I will give a future review. I really think this is the best test kit you can buy for Phosphates. It gives you a very accurate reading and it gets the job done in about 5 minutes. Simple to use. I would though prefer the regent to be liquid than powder but other than that small detail this is a great item and I would recommend it to any hobbyist who wants an accurate reading. This was my first HANNA checker purchase. Ive been hearing all the rage about these for a while so i finally tried. Very east and simple to use. Less then 5 minutes to test and get results. Definitely will be trying a few other HANNA checkers now. Not sure why Hanna doesn't just Discontinue this product even though they know it's more suited for "Fresh" water than marine usage. I've owned this for 6 months and never had the digits read above 0.00 ppm! Had the signs apparently of having phosphates with algae growing constantly on my glass! Went and purchased RedSea's Phosphate test kit and Salifert's test kit just to make sure and too my surprise not only I had phosphates present in my reef tank but that the results showed RedSea 0.8 ppm Salifert 0.07 but yet my Hanba HI-713 can not detect these units! I emediatly called Hanna Headquarters in Smithfield Rhode Island and to my surprise, they told me that the HI-736 ULR which is the "Ultra Low Reading" test kit would be more suitable for me, which really indicates that thier aware of this problem! IMO, maybe they just never made an attempt to recall this model of kit in in order to save tons of money they just went ahead and slapped on the "Fresh & Marine " label and kept it as is but clearly if you don't see a "Fish" label in front of your handheld with the "Marine" label as well than it's not suitable for Marine! Unfortunately this problem is not going away! Reefers Be Advised, purchase the ULR instead! I see on here that some users suggest buying the hi736 instead. Which one will work best to determine your overall PO4? We personally use the Phosphate low range in house as it is accurate enough and we do not need to convert the reading from Phosphorous to Phosphate. While the Ultra Low range will give extra decimal placed to your answer We find this is not the most important. Feel free to let us know if you have any further questions! Since the Hi713 and reagents are the same for both fresh water and marine, is it safe to assume variations of salinity will have no bearing on the results? Great question! That is a safe assumption to make, salinity should not effect the reading with this checker. How many test does this kit provide. Thanks. Does this meter require periodic calibration with some kind of calibration solution? One of the first steps every time you test is to zero out the meter, then you add reagent and test the actual sample. This is done every test but It does not require any sort of extra calibration procedure on top of that.